We are a family friendly Church. All are welcome. Come and join us for our regular Sunday Service at 11 am. On the first Sunday of each month, our service is followed by refreshments and time to chat and catch up with other members of the congregation. Share in the Mission of Jesus. Proclaim the Gospel in word and action. Celebrate and share God's love in worship, fellowship and witness. Build strong links with the community. Serve our community through relevant projects. The Men’s Breakfast Fellowship meet at Ledgers Road on the first Saturday of each month. Around 8-12 men from Ledgers Road, Hampshire Avenue and St Andrew’s Methodist Churches meet for worship, fellowship and breakfast together. If you would like more details or would like to join us, please contact us or just come along. The Bible Study Group meets on alternate Thursdays at 10.15 am..
We hold regular Fund-raising Events such as Caribbean Evenings, Summer Fêtes and, Christmas Bazaars, as advertised in the Circuit Diary. We support the Slough Foodbank with regular donations of much needed items. We also organise Fund Raising Events to support Charities. In 2017, for example, we raised over £1000 for the British Red Cross Hurricane Appeal. Our Church underwent major renovations in 2013. Pictures of the premises at various stages while the work was in progress, are included in the Ledgers Road 2013 album in the Picture Gallery. 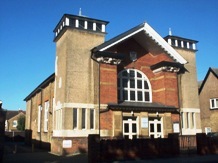 In January 2014 Teeny Boppers Montessori Pre-School moved into Ledgers Road Methodist Church Hall. They are independent of the church, but we have developed a very positive and friendly relationship since their arrival. If you would like more detail on the pre-school visit their site here. Once upon a time there was a small village, made up of just 60 cottages. In the archives of the District it is described as a dusty and unhappy looking village with one redeeming feature … a brook with water that had very special qualities! Even Royalty at that time was known to come and sample this water. The time was about 1840; changes were beginning to take place, but not very quickly. People were starting to move from the more expensive urban areas of Slough to the rural areas, and the village of Chalvey was starting to grow. People had to scrape a living as best they could, and a man was fortunate to earn even a few shillings. But what they lacked in worldly goods, they more than made up for with their great spiritual fervour. They made an immense contribution to the religious life of the whole area. It must have meant great sacrificial giving on their parts because it was in Chalvey that the Congregationalists started up in 1806, the Methodists in 1848 and St Peter's Church in 1860. In 1854 the Congregationalists moved to larger premises. Up to this time the Methodists had been meeting in a private house; now they bought the former Congregational chapel for £250. 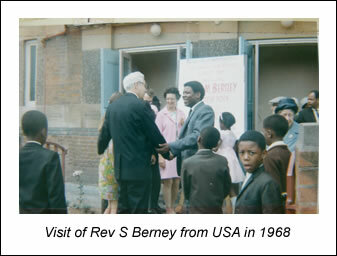 They had a growing Sunday School and a membership of 20. 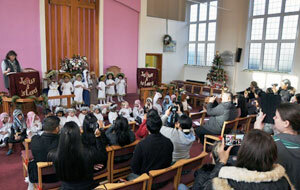 However, some of their members came from Slough and they felt they should have a Chapel of their own. So, in 1877, a small Chapel was built in William Street, Slough. Chalvey was still a village. Ledgers Road was then Ledgers Lane with fields on either side. But it was the turn of the century and life was starting to move at a slightly brisker pace. Changes were taking place … the fields in Ledgers Lane were being purchased for development and houses were springing up quickly … so it was quite an astute move on the part of those Trustees to earmark one of those sites for the church. The purchase price was £390, but the developer must have been quite sympathetic to their cause, because he gave them £300 towards the costs! (Later, in 1902, they sold their old building for £260!). They had secured the site and pressed on with their plans. The lowest tender, £2,010, was accepted. How much would that be in today's money!? The Chapel was finished in 1886 and for the first 50 years, Methodist church life in the village was fairly constant but effective, attracting morning and evening congregations of 30 - 40 and an afternoon Sunday School of around 60 - 70 children of all ages. There was also a Sisterhood meeting for the ladies of the Chapel and a Men's Fireside which attracted members from the nearby Ledgers Road Church. I wonder how many Church Council meetings were called before that decision was made, how many hours of burning the midnight oil wondering how they could possibly find all that money. But they were not deterred. 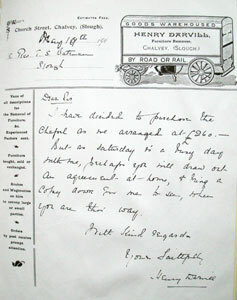 Plans went ahead and the stonelaying was arranged for 21st July 1900. This undertaking is a very bold venture and quite a few doubt its wisdom, but God has so wonderfully opened the way, its success is now assured and the importance of our Methodist Church and its importance in this neighbourhood has been fully and heartily recognised. The new church … open! The faith and devotion of those early Methodists was now vindicated but, of course, their problems were just beginning. The endless meetings and discussions with the Architects, the progress or the lack of it with the builders, the never-ending work of raising money, must have caused dreadful headaches, but their tenacity was rewarded. 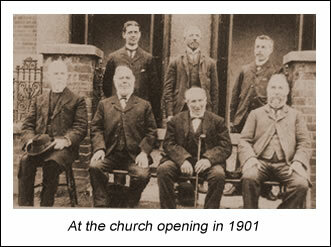 The Church was built, and opened on Good Friday, 5th April 1901. The Mayoress of Windsor and Mrs W Creak performed the ceremony of unlocking the doors of the Primitive Methodist New Church Chalvey, using keys of solid silver which had taken two days to come from Birmingham by registered post! Those who had worked so hard saw the rewards of all their labour, the Church membership was 60, the Sunday School numbered 130, and Ledgers Road has continued ever since. Through faith the foundations were laid against very heavy odds. By the time of the opening, £1670 had been raised towards the cost, which had risen to £2800. In 1901, the Trust had to raise a mortgage of £1,000, which took until 1942 to pay off. Whatever the problems, and they must have been innumerable, the doors of the church have never been closed. The good news of the Gospel has been proclaimed faithfully. The people who worship today are simply carrying on from where the founding fathers left off. As one generation has followed another, changes have taken place. What was done yesterday is not always acceptable today. In 1990, members embarked on an ambitious programme to completely modernise and refurbish the entrance vestibule and the worship area – making it more appropriate to the needs of the day. This included getting rid of all the brown paint the Victorians seemed to love. 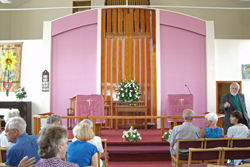 No longer would the congregation have to sit on hard pews – there would be comfortable chairs! The work was proposed, agreed, tenders received, one accepted and all the work not merely started, but completed entirely within the space of 2 years… The major hurdle faced by the congregation during the process was the increase in the cost of the project. Originally budgeted at £60,000, it rose to £80,000 due to extra work found necessary, such as the need to install new wiring throughout the whole building, new heating units, and an increase in the VAT rate. The Church Council agreed to reduce costs by excluding some of the planned changes, and the final costs were just under £70,000. By Christmas 1991, the dream of a "new" church became reality, and members returned to worship in a more attractive church. 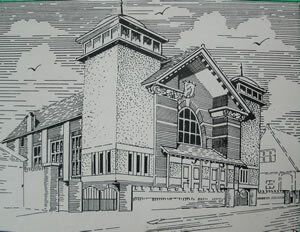 The official re-opening and dedication took place on 1st February 1992. The guest speaker was Rev Peter W Sutcliffe BA. The Chairman of the District, Rev Colin G Rowe, and the Superintendent Minister, Rev David S James BD, were also present. No matter how the people and buildings change, the message remains the same – yesterday, today and forever. People worship faithfully week by week, and bring their children to be baptised here and watch them grow through the different departments of the church. People come in times of joy and in times of sorrow. People come for spiritual and sometimes material help. People have gone to other lands and people have come from other lands. They have all listened to the same message. The seeds were sown here but the harvest belongs to God. In our generation we can see history repeating itself! The members of Ledgers Road have again spent years raising funds for an ambitious project which included building repairs, and internal restructuring and refurbishment, to bring the premises up to the stringent health and safety standards and disabled access required for the current decade. To enable members to continue to share the message of their wonderful vision of God's love. To provide a resource for renewing, strengthening and empowering the local Church community. To provide a resource for mission, outreach and explorations in worship and learning. To provide a resource which can be used by the local community. The work was undertaken in 2013, with the church closed for 4 months, quite a lot longer than planned. Despite the church having an "asbestos-free" certificate, asbestos was found ... And then there was a leak in the roof .. But, success at last! 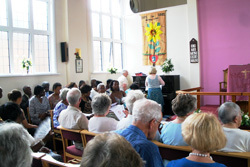 There was rejoicing when the members returned to their spiritual home ... for Pentecost, with the first services in their renovated premises being held on 19th May 2013, though initially, while the Sanctuary was being completed, services were held in the Church Hall. An Open Day was held on Saturday, 27th July 2013, and included the Official Opening of the premises. 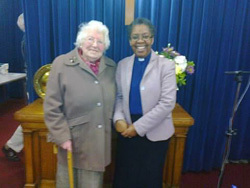 In March 2013 (when the Church was closed for refurbishment), Mrs Meg Few, a long-standing member of Ledgers Road Methodist Church Slough, became Ledgers Road's first centenarian! She is shown here with Rev Sonia Hicks as she celebrates her 100th birthday. Well, Chalvey is no longer a village, it is a bustling suburb of Slough. The houses are occupied by peoples from the far corners of the earth. Ledgers Road is a very busy thoroughfare but this Church stands like a beacon, towering over it all – a fitting memorial to those brave souls who had the faith, the courage and the fortitude to press ahead with their dream until they saw it fulfilled. 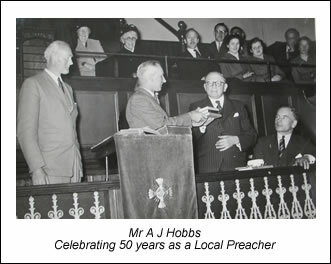 This article is based on a talk by Mrs Meg Few, entitled “A History of Ledgers Road Methodist Church 1901 – 2001”, given on 17th March 2001 as part of the centenary celebrations of Ledgers Road Methodist Church, Chalvey, Slough.